It's that time of year again - the annual Cairdeas release is upon us. This will be the third one in a row I've tried. And I've got a brand new 'Friends of Laphroaig' glass for this. Nose: Very sweet. With sticky pudding and red fruit notes. Even a hint of peaches. The Amontillado casks used have imparted a lot of their flavour. So much so that it dominates the smokiness which is only there in the background. 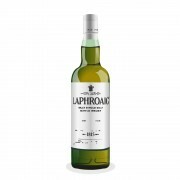 Palate: Much more classic Laphroaig now. The medicinal smoky notes immediately hit but there then follows a wave of sweet red fruit. Strawberries and raspberries, even slightly treacly - relatively thick mouthfeel. Finish: The sweet fruit slowly, (and I mean slowly) fades to leave a dry slightly bitter and ashy finish. It's a little bit like Ardbeg's Uigeadail and a very pleasing dram. If I was to nitpick I'd say it was a little bit unbalanced towards the sweet fruit side leaving Laphroaig's traditional smokey character lagging behind a bit. But then again, aren't the Cairdeas releases all about trying things a bit different? Laphroaig Cairdeas 2014 Brilliant Experimental Laphroaig! Laphroaig Cairdeas 2014 Bloody Brilliant! @nemesis Thanks for an honest appraisal. The annual Laphroaig Cairdeas releases are always exciting and awaited with anticipation. Your description is excellent and as a Laphroaig fan I feel I already know what to expect.